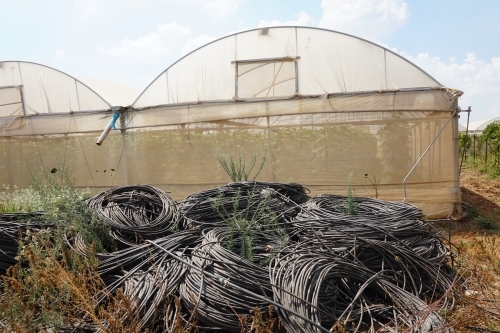 Agriculture project in the West Bank brings cutting-edge irrigation technology to Palestinian farmers through a pioneering public-private partnership. West Bank (September 2018) — Near East Foundation (NEF), is in the installation phase of a water management project in the West Bank to address water scarcity and increase agricultural productivity. To date, five advanced systems have been installed, with an additional three set to move forward by the end of September. For the Palestinian farmers who oversee these farms, this technological upgrade will mean an increase in profit of at least 20 percent and a 40 percent reduction in the amount of water used. 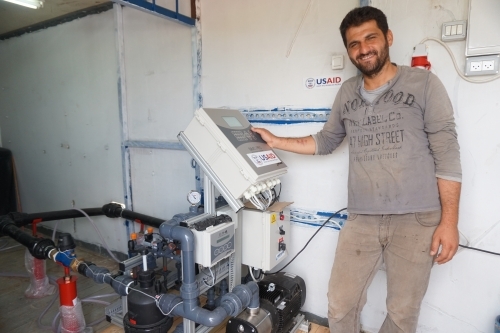 Mohammad, a new owner of a smart irrigation system in Jenin, commented on its efficiency, “I will be able to reduce water usage, fertilizers, and the number of workers needed. 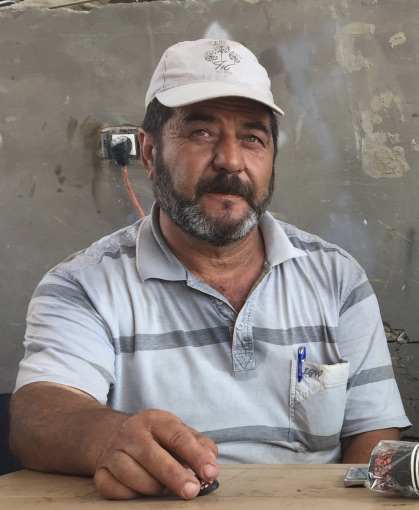 I will also be able to irrigate my farm any time during the day or night.” With the money that he saves, Mohammad plans to expand his operations. Implemented with a three-year (2017-2020), three-million-dollar grant from U.S. Agency for International Development (USAID), NEF’s efforts are a part of a public-private partnership between NEF, USAID, Netafim, and the Middle East Investment Initiative (MEII). This partnership facilitates the adoption and use of advanced farming technology to overcome water scarcity in the Palestinian agricultural sector while simultaneously increasing farmers’ access to capital. 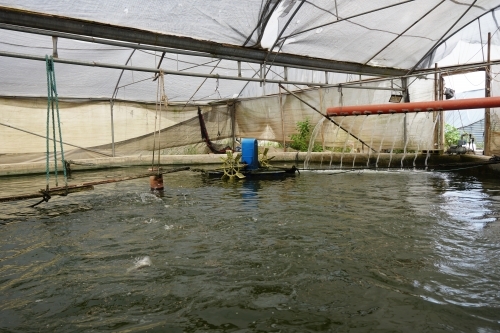 Working with the Palestinian Center for Agriculture Research and Development (PCARD), three local banks, and the Palestinian Vegetable Council, the action is structured to increase farmers’ understanding and access to credit through a loan guarantee fund administered by MEII, and through other local financial institutions. Building on this opportunity to build new relationships in the Palestinian agricultural market, Netafim, a privately-owned manufacturer of smart irrigation systems and greenhouse projects, is working with participating farmers to develop individualized irrigation system designs as well as providing equipment at a discounted cost. NEF, PCARD, and the Palestinian Vegetable Council are working together to facilitate agreements between the Palestinian farmers and Netafim, MEII, and participating banks. The ultimate goal is to encourage modernized, profitable, and environmentally sustainable agricultural development while also creating a private-sector mechanism for technology dissemination and farm equipment financing. 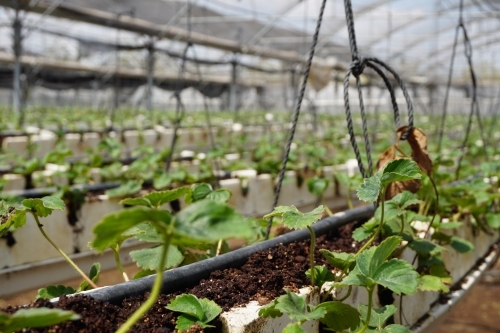 Over the duration of the project, NEF expects 20 date farmers and 128 greenhouse farmers to adopt advanced irrigation systems with crop management technologies over 507 hectares of farmland. Hundreds more will have improved understanding of and access to farm improvement loans. This project builds on NEF’s nearly 25 years of work in the Palestinian Territories. With the support of donors such as the UNDP, WFP, UNICEF, USAID, and MEPI, NEF works in tandem with local and international organizations to implement a range of projects in education, agriculture, environment, and youth development. With an office in Nablus, NEF’s locally-based program staff—all from the West Bank—includes technical specialists in enterprise, community, and agricultural development. On behalf of the American people, USAID promotes and demonstrates democratic values abroad, and advance a free, peaceful, and prosperous world. In support of America’s foreign policy, the U.S. Agency for International Development leads the U.S. Government’s international development and disaster assistance through partnerships and investments that save lives, reduce poverty, strengthen democratic governance, and help people emerge from humanitarian crises and progress beyond assistance. Near East Foundation is a U.S. based international development organization that works to build inclusive, prosperous, and sustainable societies in the Caucuses, Middles East, and Africa by providing vulnerable and disenfranchised people with the skills, training, and resources to fully engage and prosper in their own communities and economies. NEF field staff, all from the countries in which they work, partner with local organizations to find grassroots solutions to development challenges. www.neareast.org. Netafim is the global leader in smart irrigation solutions and advance irrigation and greenhouse projects for a sustainable future. With 29 subsidiaries, 17 manufacturing plants and 4,300 employees worldwide, Netafim delivers innovative solutions in more than 110 countries. Founded in 1965, Netafim pioneered the drip revolution, creating a paradigm shift toward low-flow agricultural irrigation. Today, Netafim provides diverse smart irrigation solutions – from drippers and sprinklers to high-end crop management technology (CMT) and automated systems – for agriculture, landscaping and mining. For more information, visit www.netafim.com. MEII is a U.S. based international development organization founded in 2005 by the Middle East Strategy Group of the Aspen Institute. MEII is dedicated to stimulating economic growth and job creation in the developing world through sponsoring and managing development finance and technical assistance activities in the Middle East and North Africa. For more information, visit www.meii.us.